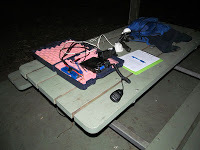 Last Saturday night was the annual QRP hours contest. This contest allows scoring only for contacts made using a transmitter of 5 Watts on the 80 m band. 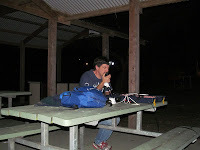 For this contest I also chose to activate SOTA summit VK3/VC-031 at the same time. I drove to the car park at the summit, packed all my gear into a small backpack and headed off down the hill, out of the activation zone. Once out of the activation zone I turned around and hiked back up to the summit. By doing this my final ascent to the activation zone is by non-motorised means and fits within the SOTA rules. I set my linked dipole on my 9 m quid pole against one of the supports for the shelter. I then set out the radio and lamp ready for the 10:00 pm start. Apart from a cyclist who came over to see what was going on, I had an uninterrupted hour on air. Conditions on this hill were not too good as I had S8 noise all the time, occasional peaking at S9+30. I made enough QSOs to qualify the summit and a good contest score as well. I’ll know in a month or two when the results are published how I have gone. This entry was posted in Contesting, SOTA. Bookmark the permalink.